I think I ask myself this question everyday and wonder, “How will I accomplish all the things I need to in this short 24 hour period?” For many of us busy people our workouts are the first things to get put on the back burner. Everyone knows they should workout. It’s not even that they don’t want to workout its just hard to find the time and energy to do it. So many of you have shown interest for the Endurance program but the first thing most people say is there is no way I can fit another workout into my already busy day. What everyone really needs to say is I need a plan! Well I am going to show each and every one of you how easy it is to plan your week and fit every workout into your busy schedules!! The idea of Crossfit Endurance is to do 4-5 Crossfit WODs for full time members and then fitting in 1-3 Endurance WODs a week. 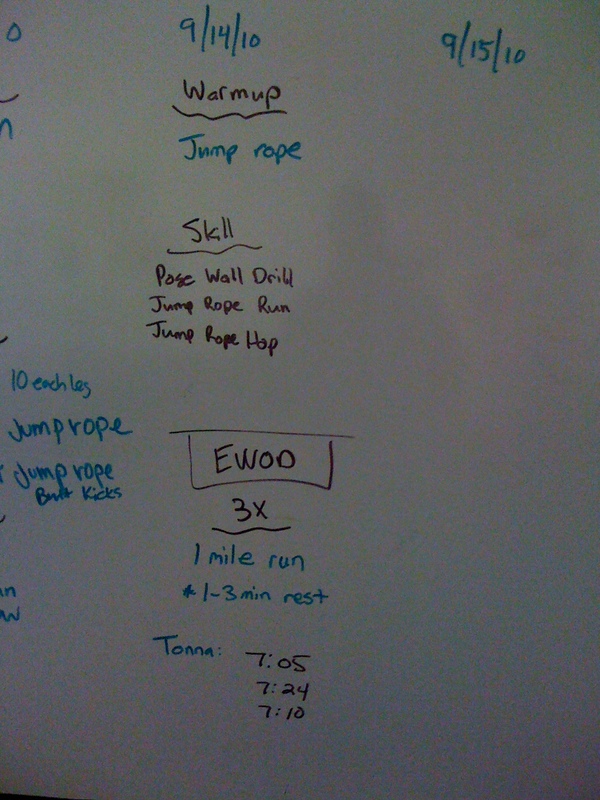 Part- time members doing 3 Crossfit WODs a weeks can fit 1-2 Endurance WODs into there schedule. Ok I know this sounds like a lot of work and workout but really it is simple. Here is an example week for a part-time Crossfitter MWF you do your regular Crossfit WOD and then Tuesday and Thursday or Tuesday or Thursday depending on if you are going to do 1 or 2 Endurance WODs a week. Full-time Crossfitters have a little different issue which is called 2 a days. This gets tricky and you really want to listen to your body and know what days are good for you to have a double workout. If you know by Thursday you are worn out you may not want to plan a double on Thursday but wait til Friday or do both at the beginning of the week. We do advise that you to one interval and one stamina WOD if you are going to choose to do Endurance 2 times a week. This is just to ensure that you get both long and short workouts in one week. Remember these are just what is recommended. You need to choose what is right for your goals and fitness level. All of this information is explained more in depth in this great article in the Crossfit Journal. I would advise everyone interested in the Endurance program to read and learn! I found a great article about the creator of CrossFit Endurance, Brian Mackenzie. It explains how he trains and why CrossFit Endurance is really working in the Endurance world! Here is a short video on hydrating yourself. This is a very important part to Endurance, and one that most of us really need to work on! So CrossFitters how well are you hydrating yourself? I would say 90% of us “runners”/ endurance athletes wake up or come home from work throw on their running shoes and hit the pavement. There is no real “form” to the way they run they just want to get some cardio in. When I am driving home, I see the same people doing the same route, running the same way and never wanting to improve or understand why they are doing what they are doing. I too, did not care how to run properly. I simply wanted to get my hour of cardio in no matter what my pace or how my form was as long as I had my hour or my 5 – 6 miles I was satisfied. Along with getting my hour or getting my miles in came knee pain, soreness and no real results to my body. After the running certification last summer I really started to see a difference not only was my form better, I was faster, lighter on my joints, and was getting a far better workout than before! Pose is the best model out there of how to run efficiently. The principles are easy to understand, yet very detailed,and are based on sound principles of correct body mechanics combined with using the laws of nature to assist with movement. The technique promotes faster running with less injury potential. Holding the correct running posture will allow you to maintain better speed with less effort. Many runners lean forward too much by bending at the hips, which actually pushes them back behind the general center of mass. The hips should be pulled forward under the chest with the head staying in alignment as well (the head should not be forward of the body). Try to pull your foot straight up off the ground as your GCM passes over it instead of trying to push-off with the back foot to propel you forward. This keeps the form compact and quicker, while less prone to fatigue or injury because the full range of the limbs is not being used. The knees should never fully straighten at any time while running. A mistake many make is to extend the leg out the back to get a full push-off, but since the general center of mass has already passed by this is a wasted motion. Try running this way and see how much more efficiently you run and how much better your body feels after those miles! Why is Rowing so hard? 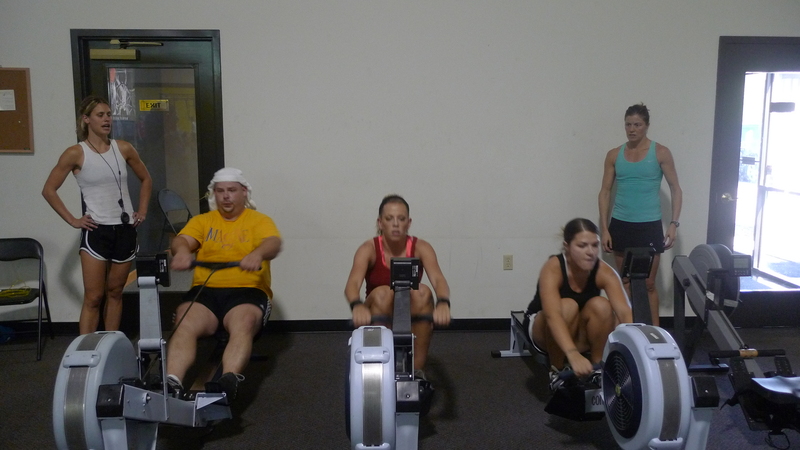 Everyone wants to know why rowing is so much harder then many of the other cardio machines at the gym. This article from the Crossfit Journal gives you a look into all the body mechanics and power that goes into rowing at your most efficient level! 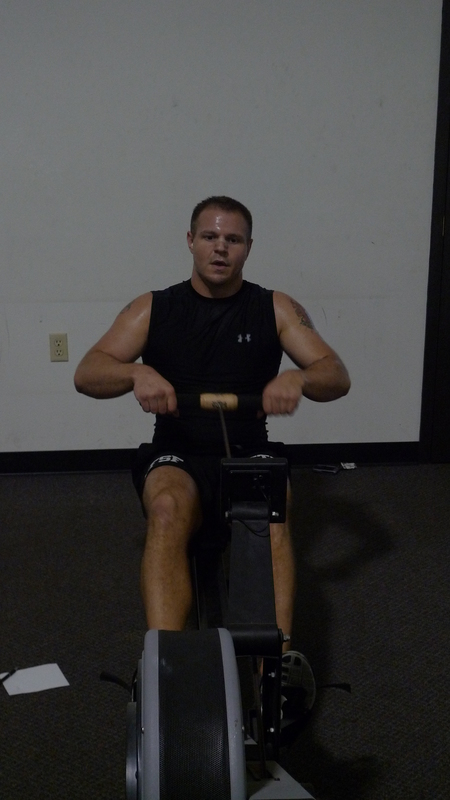 You are currently browsing the CrossFit Sioux Falls Endurance blog archives for September, 2010.